Orange County maintains nearly 2,800 lane miles of roads in unincorporated Orange County. Those roads all need to be kept in line with road reflectors and street markings to help keep drivers safe and moving. Orange County’s four-person in-house striping crew takes pride in their job of overseeing the laying out of crosswalks, stop bars and double yellow lines. Few know that the roads aren’t actually painted. The crew uses a high-tech material called thermoplastic, which is heated to 400 degrees Fahrenheit and applied by a manually pushed machine called a handliner. It usually takes one to five minutes to dry depending on road and air temperature. The thermoplastic is mixed with glass beads, which serve as tiny reflectors in the road. An additional safety and reflectivity structure that is positioned next to the double yellow lines is called a raised pavement marker. Furbush has been in the striping crew business for almost 25 years and has seen the technology evolve. The crew recently obtained a $100,000 machine called a kettle, which is used to mix thermoplastic materials on site and helps make the job faster and more efficient. 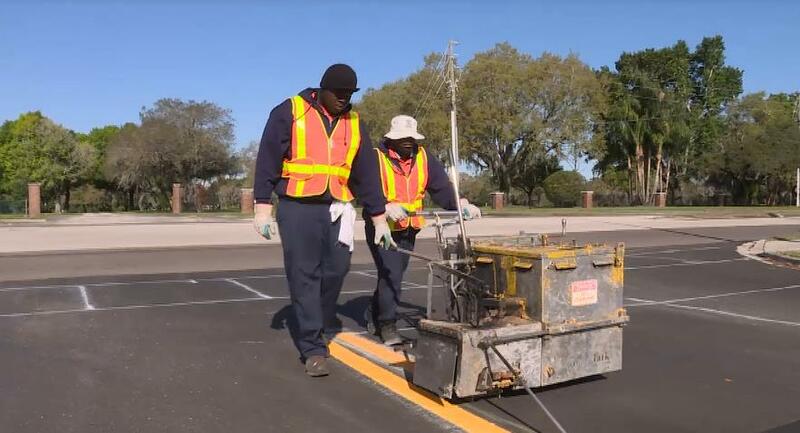 For any project over a mile, Orange County contracts with a vendor using part of its $1.4 million annual striping budget. More than 190 miles are striped by a contractor annually. Besides roads being striped as part of the resurfacing program, roads are on a seven-year-cycle system to be repainted. The crew also pinpoints roads that need refreshing throughout the County and citizens may call 311 to make suggestions.